The 2009–10 NHL season was the 92nd season of the National Hockey League (NHL) and the 100th season since the founding of the predecessor National Hockey Association (NHA). 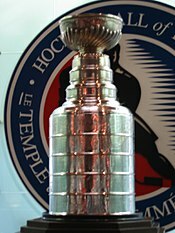 It ran from October 1, 2009, including four games in Europe on October 2 and 3—until April 11, 2010, with the 2010 Stanley Cup playoffs currently being played, all the way up to early June 2010. A mid-season break from February 15 to February 28 occurred to allow participation of NHL players in the 2010 Winter Olympics in Vancouver. Because of the Winter Olympics break, there was no NHL All-Star Game for 2010. The fewer number of games played. This would mean that a team scored more points per game than another team. The greater number of points earned in games between the tied clubs. This would be the team that was better than the other team when they played against each other. The points earned in the first home game played by the team with more home games do not count. The team with the most points earned per game in games among those clubs. The "odd" games between those teams do not count. The team with the biggest differential between goals for and against for the entire regular season. This would be the team that won their games by the most goals. The following goaltenders led the league in goals against average at the end of the regular season. After the regular season, the standard of 16 teams qualified for the playoffs. The Washington Capitals won the Presidents' Trophy for having the best record in the league, at 121 points. Division champions maintain their relative ranking during the entire playoffs while the remaining teams get reseeded below them after each round. ↑ 1.0 1.1 1.2 1.3 1.4 1.5 "2009-2010 Standings by Division - NHL.com". NHL.com. The National Hockey League. Retrieved 2010-05-01. ↑ 2.0 2.1 "2009-2010 Standings by Conference - NHL.com". NHL.com. The National Hockey League. Retrieved 2010-05-01. ↑ "Player Stats: 2009–2010 Regular season: All Skaters – Total Points". National Hockey League. ↑ "Player Stats: 2009–2010 Regular season: Goalie – Goals Against Average". National Hockey League. ↑ "2010 Stanley Cup Playoffs: Conference Quarterfinals". NHL.com. The National Hockey League. Retrieved 2010-05-11. ↑ "2010 Stanley Cup Playoffs: Conference Semifinals". NHL.com. The National Hockey League. Retrieved 2010-05-12. ↑ "2010 Stanley Cup Playoffs: Conference Finals". NHL.com. The National Hockey League. Retrieved 2010-05-24. ↑ "2010 Stanley Cup Final - Blackhawks vs. Flyers". NHL.com. The National Hockey League. Retrieved 2010-06-09. ↑ Gelston, Dan (2010-06-09). "Blackhawks win first Stanley Cup since 1961". google.com. The Associated Press. Retrieved 2010-06-09. ↑ "Player Stats - 2009-2010 - Regular Season - Summary - Plus/Minus". nhl.com. National Hockey League. Retrieved 2010-06-04. ↑ "NHL Tuukka Rask Profile". sportsnet.ca. Rogers Sportsnet. Retrieved 2010-06-04. ↑ "Martin Brodeur". cbssports.com. CBS Interactive. Retrieved 2010-05-26. This page was last changed on 28 November 2018, at 20:38.